The Geneva Motor Show gets bigger and better every year. Here's the 2011 event. It's different to see a manufacturer not conforming to the seven-year model cycle: this is the sixth generation Cobra in over 100 years. Geneva hosts the AC Mark VI, due in the shops later in 2011 and packing a Corvette sourced V8 engine. 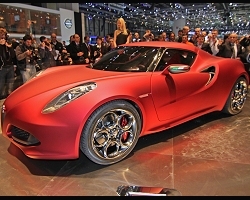 We knew that the Alfa Romeo 4C concept would be good, but who could have predicted this? A mid-engined, rear-wheel drive, carbon fibre sports car that weighs only 850kg. Oh, and it hits the dealers in 2012. One of the undisputed stars of the show. What do you mean, "it looks like all the other ones"? This is evolutionary design at its best, and if you can't see that, bucko, then... oh alright then, you win. The DB9-based Virage plugs the gap between the DB9 and the DBS, says Aston. We remain cynical about the extent of its newness until we drive it for ourselves. Both the front and the back of the A3 Concept are significant. The front because it previews the look of next generation Audi A3, due next year, and the back because it effectively confirms that the next A3 line-up will, unlike the current generation, have a saloon variant. A mini A4, if you will. Or to extend the idea further, a more mini A6. Or an even more mini... you get it. Italian styling house Bertone calls it the B99; everyone else is calling it the new X-Type. It's not really, but any Jaguar badged saloon that's about the size of a 3 Series is bound to be saddled with that tag. Not many would complain if it did become the next X-Type, looking at it. Ian Callum (Jag's design boss) might take the huff though, so it probably won't. Following the success of the MINI E trials, BMW debuts its next electric test bed in Geneva in the form of the ActiveE. It's based on the 1 Series Coupé and BMW promises unrivalled zero-emission driving dynamics coupled with almost all the usability of the donor car. The ConnectedDrive concept not only previews the styling of the next Z4, but also of a new, smaller sports car set to rival those from the VW Group - including Porsche and Audi. It has cool slide down doors like the BMW Z1 and a triple-tiered 3D light display for the dashboard. The four-door version of the 'race bred' Cruze we have seen already. Here's the five-door hatchback variant. It adds a welcome dose of practicality, sure, but it's no show stopper. Ferrari could stick a horse on the front of a wheelie bin and it would muster up some excitement, but the four-seat replacement for the 612 Scaglietti is big, big news. It looks unlike anything Ferrari has done before. Oh, and it has four-wheel drive. Fiat's factotum vehicle is based on the Dodge Journey and isn't confirmed for sale in the UK as yet, but does have masses of interior space and equipment - two qualities we're sure the next Multipla will have if it comes to the UK. The biggest news on Ford's big stand is the introduction of the B-Max. It's a mini-MPV to take the Vauxhall Meriva on at its own game. Looks good too. It's based on the Fiesta by the way. Already debuted in Detroit, the C-Max Energi hybrid gets its European bow in Geneva - and hopefully we get more details. It's an extended range petrol-electric hybrid people carrier, capable of electric-only drive. Production starts in 2012. Not new, but Geneva provides a chance to have a close-up gander of the Ford Fiesta RS WRC car, straight off the back of its Rally Sweden appearance. Nissan is way ahead of the pack with its LEAF. The Focus Electric is Ford's answer. Once again it's already been seen in Detroit, but this is Europe's chance to look at the zero-emissions family hatchback due in the UK by 2013. Pick-up fans rejoice, for Ford unveiled its top of the line truck at the Geneva show. It's not quite an F150 in the power department, but it's as luxurious as pickups get, and it's headed for the UK at the end of 2011. With the Ford Kuga due for replacement in 2012, the Vertrek is an early look at what we'll be seeing in showrooms that year. Not a radical departure, agreed, and it's more important in America really, where it will replace the Escape SUV and try to convince America that Ford gas guzzlers needn't be that big or gas guzzling. Good luck. Prize for the best name of the show goes to the Tornante, which we're certain will become one of Geneva 2011's top five unveils when the photographer smoke clears and the list-based feature writing starts. Believe it or not, it's a touring version of the Gumpert Apollo, built for comfort AND speed. Nice. Hamann loves getting its teeth into a new BMW, so it was only a matter of time before it had a go at the latest 5 Series. The result was shown for the first time in Geneva, and will give those that can't wait for the M5 proper a nice, early alternative. The Curb is steeped in motor show concept tradition in terms of its futurism and all out wackiness, though underneath all that there's a Nissan Juke rival that could come to market in a couple of years. It's made for people with an 'active night life', whatever that means. The Hyundai i40 is the Korean company's first pop at the middle saloon market that has a realistic chance of turning the heads of Mondeo and Insignia buyers. It has dramatically upped the styling ante compared to Hyundai saloons of old. Hyundai is re-entering the stylish coupé ring with the Veloster, and it's doing so in a slightly eccentric, Prince Naseem sort of way. The Veloster has two doors on one side but only one on the other, but will compete with the VW Scirocco by being practical as well as stylish. Once Lexus got into the premium hatchback game, it was only a matter of time before Infiniti joined in. Here it is. It's a concept minus side mirrors and all the associated production jazz required by law, but the shape will apparently remain when it goes on sale in 2012 or 2013. Infiniti is expanding the reaches of its M saloon range, and having done the sensible thing and made a 530d-rivalling diesel, it's now doing a hybrid. From a fuel economy perspective this too is sensible, but its performance is rather more so - it's the quickest UK Infiniti yet. Not just an XKR in a sporty suit, but an XKR with more power and improved handling. In fact, the XKR-S is the quickest production car Jaguar has ever made. The company is also celebrating 50 years of the E-Type in Geneva. One of two new and highly stylish small cars from Kia, the Picanto is smarter, more efficient and, crucially, more spacious than the car it replaces. Due in summer 2011, there's even a sportier three-door version on the cards. Like the new Picanto, the Rio is a million miles from its predecessor in the styling stakes, and has now become a genuine Fiesta rival (assuming it doesn't drive like a beached supertanker). We're promised nicer plastics, much improved interior space and some very efficient versions. It'll probably be this that endures longest in memory once the Geneva smoke has cleared. Lamborghini did well to keep the exact aesthetic of the car under wraps until the night before the show so the launch was a shock and awe affair of the old school. Fabulous. Another prong in the Chrysler UK re-launch attack is this, the Delta. Again it's a re-badged Lancia and has the advantage of a somewhat iconic name in Delta. No rally-bred history here, though, but at least it's a genuine Ford Focus rival - something Chrysler's not had, ever. The Thema is the Chrysler 300 by another name, which means it's a thoroughly facelifted version of the 300C for European markets. Gone is the gangsta aggression of that car, replaced by smoother lines and a grille that politely asks you move aside, rather than threatens. Quality is improved, too. Chrysler sort of died a little while ago in the UK, and now it's sort of coming back, spearheaded by this re-badged new Lancia Ypsilon. The five-door supermini is based on a stretched Fiat 500 platform and gets ultra thin seats to add leg space. It also bags Fiat's lovely two-cylinder TwinAir engine. Officially called the 'Land Rover 2011 Discovery 4 'Landmark' Editions with Black and White Theme', this pair of limited edition Discos "blend high end interiors with bold, contemporary colour schemes." Already on sale in the UK. With the LFA supercar limited to just 500 copies, Lexus has taken aside ten percent for an extra special makeover. The Nürburgring LFA isn't just an orange paintjob; it's got 10bhp more than the 552bhp standard motor, as well as new wheels and more carbon fibre - the fibre of choice for all things fast, probably because it's faster than denim. Taking a leaf from Renaultsport's book, Lotus has unveiled a 'cup' version of the Elise that's lighter and more focused on dynamics, while being cheaper to buy. Not much to complain about there. You can normally expect the fruit of Mansory's labour to induce an involuntary reflux of some kind - see the Mansory Rolls-Royce Ghost for details - but with the Evora the company has kept it miraculously tasteful. It's not just a set of side skirts, however, but a front-end redesign. Not a facelift though. Let's be clear on that. Maserati loves stretching out the appeal of its core models by making limited editions, but when feeling less cynical it will put out a stoked version, complete with faster gearchanges and added loudness. That's what this version of the drop top GranTurismo is: more power, more noise, more expensive. Compact crossover SUVs are all the rage, so here's Mazda's, called the Minagi. As do all carmakers, Mazda is making noises about blueprints for future products and such like. We suggest just enjoying it in its concept glory, for now. Imagine the current C 63 AMG but with a facelift in line with the recent C-Class facelift. You've just imagined the new C 63 AMG. And lest ye have forgotten how silly the C 63 is, it has a 6.2-litre V8, and with the new AMG Performance Pack can nudge 490bhp. Different to your uncle's C-Class, then. Imagine the current C-Class saloon but with two less doors and a more swoopy roof. You've just imagined the new C-Class Coupé. And lest ye have forgotten how sensible the C-Class is, the C 220 CDI has a diesel that can nudge 69mpg. Your uncle's C 180 gets nowhere near that sort of efficiency. The latest of Mercedes-Benz's line of mini-me SLs has arrived, and it looks as mini-me SL as ever. It still has a folding hard top and is still rear-wheel drive, and we expect it'll still be setup at the comfort end of the scale: ladies what lunch don't care about handling. Stereotyping? Us? An obvious new model if ever there was one, the Cooper SD takes the diesel performance MINI to its logical conclusion (because surely there can't be a MINI JCWD on the horizon, right?). The SD has loads of torque and decent economy, while looking like a Cooper S. Showroom WIN. Saturday night's alright for a concept car launch, but a motor show is better. The MINI Rocketman is something of a tiny dancer, measuring just over the length of the original Mini, though still standing quite tall. Its carbon spaceframe chassis means it's light enough to blow away, like a candle in the wind; there's no sacrifice like weight. And if you're thinking there's something about the way it looks, that's mostly down to the weird doors and the glass roof, which keeps the car airy, even if you let the sun go down. The precursor to a Colt-replacing supermini is what the Concept Global Small is, and very near production it is too. It's very light, says Mitsubishi, so it will be economical. It will be knocked together in Thailand and it will go on sale in 2012. Based on technology adapted from the LEAF, the ESFLOW is an electric, rear-wheel drive two-seat sportscar. It can hit 62mph in under five seconds and looks like a futuristic, shooting brake sort of version of the 370Z. Nissan keeps saying it's based on existing technology... so make it then, Nissan, we dare you. The Huayra will, in 2012, finally replace the Zonda - the supercar that seemingly won't die. We're interested in the technology that underpins the car, of course, but for the time being we're more bothered about hearing a Zonda exec say "Huayra" so we can learn how to pronounce it. There'll be a collective sigh of relief among the press when it happens, believe us. If you haven't worked out what this is from the title and moved down the list to Porsche already, shame on you. Still here? It's a Peugeot 308 with a new front bumper, some different interior trim, LED lights and a new engine. This is one of a few cars making a European debut in Geneva having already been shown in Detroit. Listen...can you hear that? No? That's the sound of nobody complaining. The 918 RSR concept is the future of racing, and it's hot. "Hmm... there's a gap between the Cayman S and the 911 Carrera. We can't make a slower Carrera, so how about a faster, better Cayman?" Yes please, Porsche. And, on another topic entirely, if you could just cancel my order for that 911 Carrera, that'd be grand. Everyone's been waiting for this version of the Panamera ever since the five-door mega hatchback was unveiled. It will have electric-only drive capability, just like the Cayenne Hybrid, while being quicker than the average big capacity turbodiesel at full pelt. Here's a plug-in diesel hybrid based on the Range Rover Sport and offering 89g/km of CO2. We're not sure whether Land Rover is caving to the green movement or sticking two fingers up at it, but either way a free-to-tax Range Rover Sport is a good thing. It's still a proper off roader, but it has a 690-mile tank range and electric-only drive. There are a myriad of aftermarket styling companies willing to take tens of thousands off you to customise your Range Rover. Finally, Land Rover has thought 'hang on a minute...' So here's the £130,000 factory fresh Range Rover, complete with two 'free' iPads and all kinds of luxury eccentricities. This is more like it, Renault. The Captur is exactly the sort of concept car silliness that Renault is really good at. It has an interior based on mountaineering, obviously, and an exterior that crosses an SUV and a two-seat roadster. They'll cross anything these days, those crazy car companies. Celebrating a year of being free from the corporate shackles of General Motors, Saab has unveiled the Independence Edition. Only 366 will be made - one for each time Saab asked for a bigger R&D budget from GM and was turned down. Not really - it's days of the year of course. Just as Touring always follows saloon at BMW, so does SportWagon always follow sedan at Saab. The Swedish company is currently finding its feet as a Spyker concern, after the whole misunderstanding thing with GM. The 9-5 estate will add much needed sales. Spain's-Premier-Sporty-Youth-Brand-Featuring-a-design-bloke-that-used-to-work-at-Lamborghini™ doesn't even have a sporty crossover SUV in its line-up, for shame. Geneva redresses that imbalance, as SEAT unveils a sporty crossover concept SUV. What chances it's based heavily in the VW Tiguan? Like a Smart Crossblade crossed with a speedster crossed with next generation's ForTwo - and electric. That's about it, really. Remember the Actyon Sports pickup truck? Well, the SUT 1 concept is its replacement. We think it's the best looking car Ssangyong has ever made, which is a shame because not that many people in the UK need a pickup truck. Still, bodes well for the next Rexton. Subaru and Toyota worked together like horse and carriage on the horseless carriage that is the Toyota FT-86. So, when Subaru said it would be unveiling a 'Rear-Wheel Drive Sports Car Technology Concept' we immediately thought 'this is Subaru's version of the FT-86.' We hope that's not its proper name - it's a bit obvious. So, you have a lovely little hatchback called the Swift. You make a 'Sport' version and it quickly becomes one of the most lauded little cars on sale. After a while you kill the Swift. You make a new, bigger Swift. What's the next step? Exactly. Just as Subaru gets around to unveiling its first version of the Toy-baru (see above), Toyota moves onto version number two. The new FT-86 concept isn't massively different to the first, but it is closer to the production car, which will possibly re-birth the Celica name. Here's an electric iQ capable of 65 miles on a charge and due to be available as a lease car from 2012. The US has already seen it - this is the Euro debut. The mildly successful Prius spawned a seven-seat variant in Geneva, which looks quite different to the five-seat version, whose shape didn't really lend itself to throwing a couple of extra chairs in the boot. Toyota has this hybrid...we forget its name. Anyway, a couple of people went and bought said hybrid. Toyota thought that maybe it would be a good idea to make a smaller version of it, based on the Yaris supermini. A couple of people might buy that too. The plug-in hybrid version of the big V60 estate is already close to production, says Volvo, even though Geneva is the first time we've seen it. It could go on sale by 2012, then. One side note: Volvo is claiming 150mpg economy and 50g/km of CO2. We'll believe that when we see it. The third small four-seat Cabriolet in Volkswagen's line-up is based on the Golf. It gets an electric folding soft top in addition to everything we already know and admire about VW's bread and butter model. The cloth is multi-layered to retain as much of the Golf's refinement as possible. The Tiguan crossover SUV is due a facelift. You know the score - you've seen the pictures. Unsurprisingly it looks quite a lot like the new Touareg, with the same sort of front lights as all VW's recent output. Car designer types call it a 'family face', which, contrary to what some cynical forum trolls might say, is NOT a clever way of getting out of designing new headlamps. Absolutely not. They're all at it, the premium makers - it's all M Sport this and S Line that. Volkswagen's sporty trim level is called R-Design, and the Touareg is the latest to get the treatment. Geneva was its debut.